5. 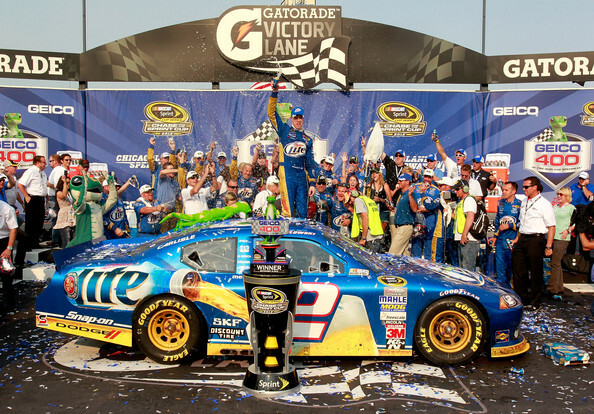 Brad Keselowski stole the show as the Chase officially began at Chicagoland Speedway on Sunday. It was Keselowski’s fourth win of the season, his seventh in the past two years, and a great start to the Chase for the man who drives the #2 car. There are still nine more races to go and plenty left to be decided. Next Sunday, New Hampshire Motor Speedway will be the place to be in NASCAR. 4. The second NHL work-stoppage in the past eight years is officially on. Hasn’t there been enough of this nonsense in the wide world of sports over the past couple of years? I for one am tired of these CBA disagreements. Sadly, the two sides at ends remain far apart on many key economic issues. Hopefully, things will get solved sooner rather than later. Many thought it was a foregone conclusion that there would be no NBA season last year. Instead, the 2011/2012 season tipped off on Christmas and was a year to remember. So I will keep the faith. 3. The MLB season is entering the stretch run. With just a couple of weeks left before the postseason, there is so much that is still yet to be decided. Thank Commissioner Selig for adding an extra wild-card to each League and providing a glimmer of hope to many teams that would already be looking ahead to spring training. My matchup of the week is set to transpire in Los Angeles. Texas Rangers at Los Angeles Angels: The wild-card mayhem is out in full force. Many including myself envisioned the Angels experiencing World Series grandeur in year one of the “Machine” experiment. Currently, the Angels are fighting for dear life for an invitation to the postseason. Texas on the other hand is looking for a three-peat in terms of American League pennants and appear to be in great position to do so. Well this divisional battle not only matches up two very good teams, it also is a potential preview of a playoff matchup. Neither of these AL West powers have exactly been on fire lately. But they are both still very much in the playoff picture as we enter the second half of September. The Angels “need” to take two of three in this series. The Rangers would “like” to take two of three in this series. Got to go with the home team that has more riding on it. Expect the Angels to make a statement and defeat the two-time defending American League champions in two of three games at Angel Stadium. 2. Week 3 was by far the best one yet in college football. Many are already referring to it as “Upset Saturday.” Rightfully so. Brian Kelly gained his marquee victory since arriving in South Bend. Arkansas showed what can happen when a team entirely gives up on a game. Stanford continued their dominance of USC thanks to the play of Stepfan Taylor, who demonstrated why he is the best running back that most people in America have never heard of in a masterful performance against USC. 1. Sunday was totally awesome baby with a capital A. It was upset city across the board. No complaints here as the most parity filled league in professional sports lived up to the reputation. Week 2 is nearly in the books, but Week 3 is right around the corner. This entry was posted in Miscellaneous and tagged ACC, AFC, Albert Pujols, Arizona Cardinals, Arizona Wildcats, Arkansas Razorbacks, Atlanta Falcons, Baltimore Ravens, Big 12, Brad Keselowski, Brian Kelly, Bud Selig, Carolina Panthers, Clemson Tigers, Denver Broncos, Florida State Seminoles, Houston Texans, Kansas State Wildcats, Los Angeles Angels, Matt Ryan, Michigan Wolverines, Missouri Tigers, MLB, NASCAR, NBA, New England Patriots, New York Giants, NFC, NFL, NHL, Oklahoma Sooners, Oregon Ducks, Oregon State Beavers, PAC 12, Philadelphia Eagles, Philip Rivers, San Diego Chargers, SEC, South Carolina Gamecocks, Stanford Cardinal, Stepfan Taylor, Texas Rangers, UCLA Bruins, USC Trojans. Bookmark the permalink.